Would you like to live more frugally? Homesteading, whether on a rural farm or in an urban townhouse, is about living a more self-sufficient, sustainable lifestyle. And knowing how to save money is one of the keys for homesteading success. I’ve previously shared some of my favorite tips for saving money by recycling stuff you otherwise would toss and putting it to good use in the garden. I’ve also shared some of my favorite homemade Christmas gift ideas to help you save money around the holidays. Now, I’m pleased to share some new resources to help you live more frugally in 2019 and beyond! 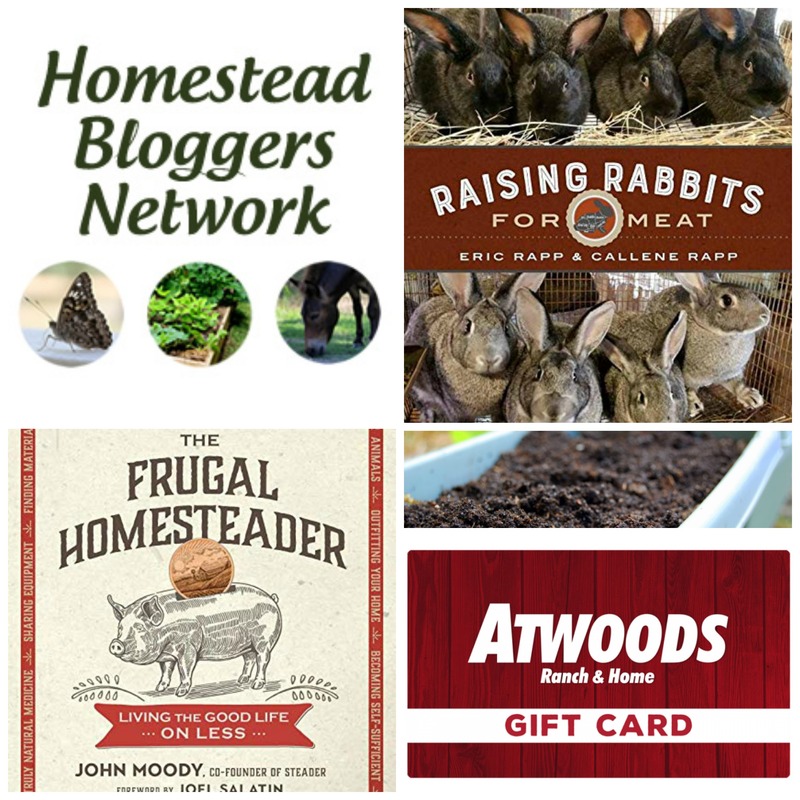 To help you begin a successful frugal homestead, I’ve partnered with New Society Publishing and Homestead Bloggers Network to bring you this frugal homesteading giveaway. This giveaway is loaded with goodies for the wannabe frugal homesteader! Learn how to achieve your back-to-the land dreams without breaking the bank with John Moody’s new book, The Frugal Homesteader. Discover an excellent budget-friendly source of food with Raising Rabbits for Meat, a new book by Eric and Callene Rapp. Learn skills for abundant living through a Steader online course. And stock up on tools and supplies you will need for your homesteading adventure at Atwoods Ranch & Home. Sign in to the Rafflecopter Widget to enter the giveaway by December 24, 2018. The giveaway is open to U.S. residents 18 years and older. Enter by December 24, 2018. Winners will be contacted by December 28th. What a great way to start the New Year! Counting My Chickens’s mission has always been to provide the information and inspiration you need to achieve a more sustainable lifestyle. These books do exactly that. Enter the giveaway above, share this post with a friend who also would love to learn, and pick up copies of the books for your homestead library. Make 2019 your best homesteading year yet! This entry was posted in Living the Good Life and tagged frugal living, giveaway, homesteading by Deborah Neyens. Bookmark the permalink.